Today marks the release of Ubisoft's Rocksmith, a music game that may seem a bit on the late end of the Great Music Game Craze of 2009. All the same, it comes with a tantalizing promise: it allows players to plug a real guitar into their game console via a 1/4 inch-to-USB cable and play real notes along with the game. This is an important step away from the plastic instruments of Rock Band—even the Fender "pro guitar" that was sold with Rock Band 3 used a MIDI output and not an analog output. The ability to plug one's own guitar into a PS3 or 360 to learn songs sounds pretty cool. But what do our guts say? It's Gut Check time! Brian Crecente, occasional guitar plunker and all-around terrible musician: The notion of learning to play a guitar by playing a game is always wonderfully appealing to me. It was with Power Gig and with Rock Band's last title. And in many ways Rocksmith comes closer than any of the three to delivering on that promise. But ultimately what you have in Rocksmith isn't a game, it's an instructor, an instructor with a peculiar way of teaching that may get you to play songs, but still not understand what you're really doing. If you're looking for something that will mechanically run you through the progressive skills it takes to learn to play something like Nirvana's In Bloom, then get this. But if you want a game give Rocksmith a pass. No. Brian Ashcraft, skeptic: No way. If you are asking whether or not you should get Rocksmith, then definitely don't. This is an extremely niche title, that could leave you with a large, pricey peripheral you never use. Rocksmith is for a special type of gamer. If you're not sure if that's pertains to you, then, dear god, do not get this. No. Owen Good, Who Certainly Has Some Rock Star Facial Hair: Rocksmith does look interesting and certainly is a novel piece of software. But my gut says no because of its tight niche appeal and its need for one hellaciously expensive piece of hardware. Further, I could see casually interested musicians, with a guitar gathering dust, buying into the snake oil that this really will teach them to play guitar. That's a claim that's been sold in the back of comic books for decades, and it's one of which I am always skeptical. No. Richard Zolko, Fahey's Brother, Guitar Enthusiast, and Video Game Name Mixer-Upper: I've been playing it more and more since Michael passed it this way, and I'm really getting into it. It takes awhile to get used to matching up your frets with the screen, but if you screw up it slows down for you, letting you catch up. I can really see how this would be great for new guitarists that started out playing Guitar Band or Rock Hero. Yes. Kirk Hamilton, Multi-Instrumentalist and Music-Game Liker: Okay, so. 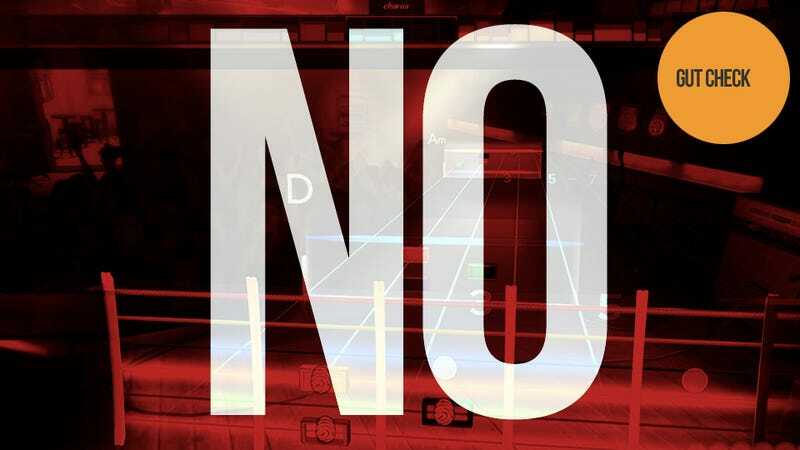 We're getting a lot of "No"s across the board here, and as a result I'm going to give Rocksmith a "yes." But it's only a symbolic "yes," because this game does a lot of things very right, and I want to reward that. It manages to do what Guitar Hero and even Rock Band only hinted at—take real-world musical instruction and apply it to a video game setting. It's well-made, and it works… except for lag, which bugged the crap out of me but which I eventually got around. Rocksmith is just so niche… I mean, this game is only a "yes" if you want a real guitar game that will teach you to play the instrument in the context of a Rock Band-like setting. I already felt a little weird about giving Dance Central 2 a yes for similar reasons, but at least anyone can play that game. Rocksmith is just so niche. It does what it does well, but only a very few people are going to really want that. So, it is with the realization of the majority opinion that I raise my pick to the sky and say Yes. And so we wind up with a "No" for a game that isn't poorly made, it's just a bit too late and a bit to niche. That said, if you're a guitarist with a game console who wants a game to teach him some new metal songs, go forth and Rocksmith!